We just came back from our ‘vacation,’ and I can tell you that I am ecstatic to be back home in TEXAS. There is no place like HOME SWEET HOME! We visited Miami, South Beach and Little Havana. I have visited Orlando a couple of times, so I felt sure I would totally enjoy my travel to Miami. Surprise…Miami, is like entering a different country. Born and raised in San Antonio where Spanish is spoken by many, I was surprised that everyone in South Miami spoke Cuban. Notice I said Cuban because it is a little different from Spanish. At all the shops and restaurants, all the clerks first addressed me in Cuban, and if I responded in English, then I was acknowledged with English, but not until then. 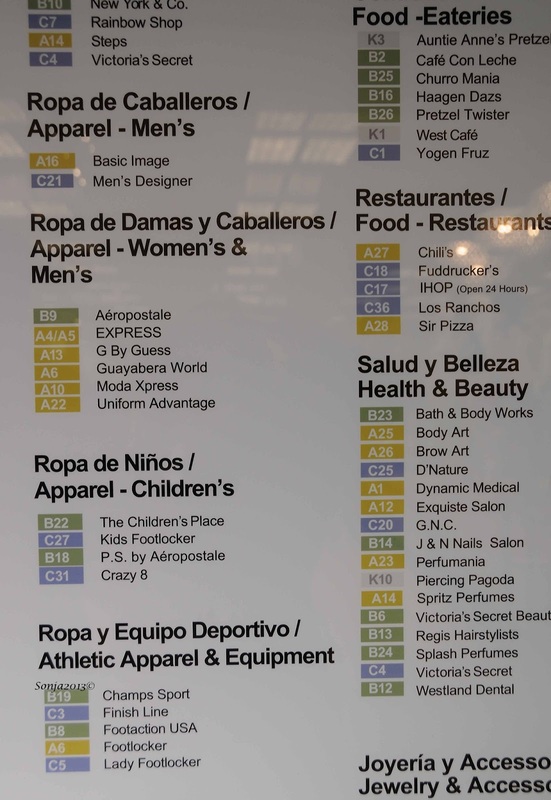 I had to visit an ATT store, and again, it was Cuban first and then English. I was told that in South Florida, you could not be hired unless you are bilingual. The English spoken was good and so was their Spanish/Cuban. My point, America is changing. America is changing whether we like the change or not. 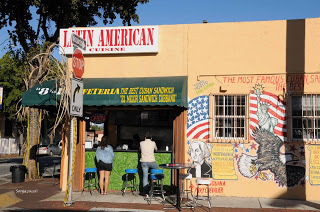 My enjoyment comes from photographing, and ‘Little Havana’ is just a few blocks from downtown Miami. 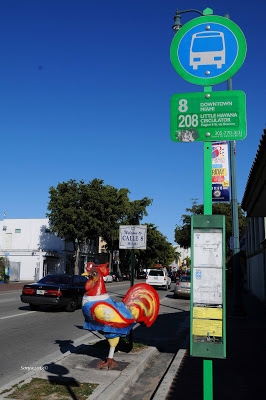 We visited ‘Little Havana’ on a lazy Sunday afternoon and found a large rooster greeting tourists. We drove around the area which is not really very large and then walked the main street. It is a modest neighborhood filled with small homes that replicate the architecture of Cuba. 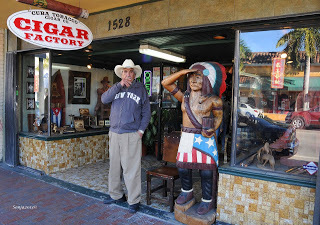 We entered and browsed in some of the shops in the heart of ‘Little Havana’, Ocho Street. The following conversations took place with the residents of the places we visited. I did not dig deeply into any of the answers as I wanted to remain calm and happy on our vacation. But there is plenty of room for thought in these short conversations. I am always attracted to the local artists, and I found an artist who depicts the Cuban art form. 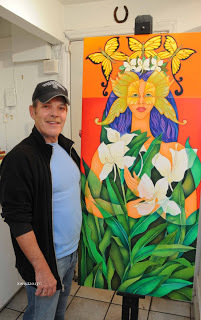 We met and spent some time visiting with Molina in his art studio. Turns out he is a refugee from Cuba who has been here for over 30 years. He told us that Americans really do not understand the Cuban government. He repeated this several times over. He told us he misses his Cuba but would never go back because of Fidel Castro and what his Cuba has become. We purchased his rendition of the Virgin of Cuba, which I will proudly display in my home. There were eateries offering Cuban Sandwiches and several cigar stores and plenty of pawn shops and a Cuban Art Center. I entered a souvenir shop, grocery store and even a barber shop where the two barbers had men waiting to have their hair cut. 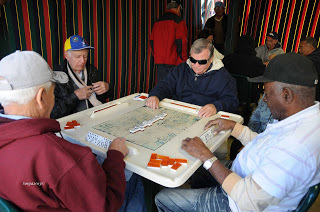 It seems to me that the Cuban Americans are friendly, love their car horn, cigars and cherish their time playing dominoes with friends. 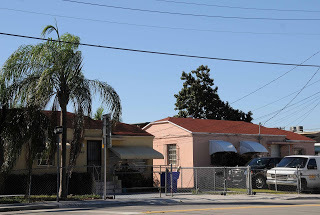 We stayed in Hialeah Gardens because this area was close to Miami and to the Miami Port before we left on our cruise. We dined out on Saturday night at a very nice restaurant in a shopping mall close to our hotel. 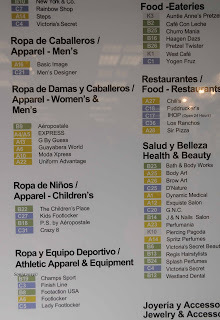 Before we arrived at the restaurant, we were taken aback some to read the mall directory in Spanish first and then in English. While waiting for our waiter to serve us our Cuban food, we had a conversation with the ‘water boy’ at the restaurant which left me speechless. We asked this young man if he could direct us to the local Catholic Church. To my surprise this was the conversation that followed. "Church, I don’t go to any church so I don’t know of any. The people I know practice ‘Santeria’ in their homes. Don’t you know we are Hispanic and we don’t go to church?" My understanding of ‘Santeria’ is that it is a cross between voodoo and Catholicism. The closest I have been to a ‘Santeria’ altar and ceremony was in New Orleans, Louisiana. He then told us that the entire area was ‘Hispanic’, meaning Cuban, and ‘Hispanics’ do not attend church, a totally shocking statement coming from this young man about 20 years old. Obviously this young man is a product of Communist Cuba. He did have one question for us. He wanted to know if we all owned guns in Texas. YES, I replied! Pope John Paul II went to Cuba in 1998 to evangelize after 40 years of communism. The water boy at the restaurant was wrong. 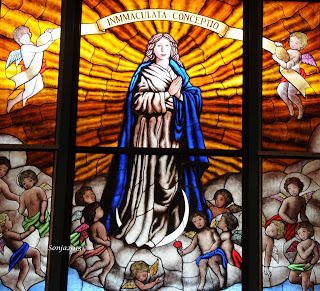 We were able to locate a Catholic Church in the area, Our Lady of the Immaculate Conception. And of course, it was full of Cuban Catholics. I even had a very informative conversation with a young deacon who will be ordained a priest in May. 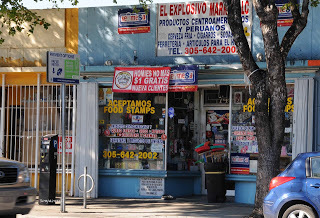 He was excited to speak to a Texan of Hispanic descent and related his struggles in Richmond, Virginia where there were ‘social’ problems with the Mexican immigrants and the local residents. This soon to be ‘Cuban’ American priest had without meaning revealed his biased opinion. He actually believes that all Mexican immigrants legal or otherwise are migrant workers. We definitely have a communication and an education problem in America. So how do we here in Texas change that image? We can change this image by informing ourselves about the Texas Mexican Americans. NOT all Texans of Mexican descent had families that came over as migrant workers. Historically Texas was once part of Mexico. During the Mexican Revolution, many fled and became American citizens. These immigrants were the educated and shop owners and were Spaniards or from other European countries married to Mexican nationals. The Mexican Revolutionaries were infamous for murdering European shop owners. Today most of the immigrants coming to America are here because they too want to experience the American Dream. And yes, there will always be takers. The TAXI cab driver we had was Haitian and he asked if it was true that all Texans were Republicans? I laughed and said YES, we cling to our guns and our bible! The shuttle bus driver from the hotel was also a Haitian. But he had a very interesting slant on what it is to live in America. He said that he had to work very hard to earn the little money he makes to pay for all his bills. If you don’t make your payments, then you can lose your house and your car. So he said, it is very hard to live in America. I did ask him if he wanted to go back to Haiti. He told me he did not have a choice but to live in America. Apparently he is blind to the fact that we all have to work and pay for our houses and cars. Could he be one of Obama’s zombies, believing that others should pay for his keep? I did not ask, I wanted to stay happy. After all I was on vacation!